When I hear the words mobile and wireless speakers, I immediately think of Bluetooth. If I had to pick the least favorite feature of any iPad, I would say that it is the built-in speaker. The tiny single mono speaker of the iPad is my least used thing on my beloved device. Since the iPad is a large iPod touch, you will naturally want to use headphones with this device, but Apple did not include its traditional white headphones with the iPad.I believe that Apple chose not to include the wired headphones with the iPad because many users would accidentally pull their $500+ device to the ground the first time they forgot to remove the buds from their ears or unplug the headphones from the device.Unlike its smaller iPod Touch and iPhone cousins, the iPad doesn't fit in your pocket while securely attached to a wired headset. The iPad is often resting on your lap, resting beside you or sitting nearby, but no wired headset would be adequate for the iPad. The iPad screams to be used with headphones, but I believe it screams louder or loudest to be used with wireless Bluetooth headphones instead of wired headphones. The LG Tone - HBS-700 Wireless Bluetooth Stereo Headset - Retail Packaging - Black/Orange is the best device for the iOS devices. The LG Tone brings you the high quality audio experience of stereo sound that is often missing in traditional Bluetooth wireless options . The LG Tone is not the first stereo Bluetooth on the market, but is one of the first devices that is both adequate battery life and comfortable. The Motorola S-series headsets were designed poorly with the weights pulling down on your ears all day. Additionally, Motorola branded Bluetooth devices are very rigid and have inadequate battery life. 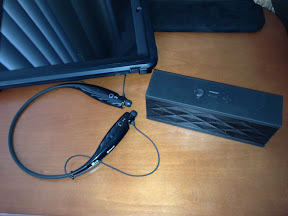 Plantronics backbeat got rid of the rigid band that Motorola sported. It had a soft comfortable band, but you had wear huge hearing-aide like receivers on both of your ears all day and the battery drained even when the device was turned off. LG claims that the LG Tone will get Up to 10 hours of listening/talk time; my experience is much longer. I go all day on a charge and a maybe a few more hours the next day. The device will turn itself off if not connected to a device, thus preserving the battery for when you need it. Typically I charge the headset nightly with my other gadgets. Fortunately it doesn't have a proprietary charging port or Mini-USB like other stereo headsets I have used. It has a micro-USB, which has become the industry standard for most Non-Apple devices. With its unique form factor and sleek design, the LG Tone has an around-the-neck wearing style, ensuring your comfort throughout the day. I truly do wear the LG Tone all day without realizing I have it on; I often sling it across the room when I take my shirt off at the end of the day, because I forget I am wearing it. The LG Tone takes regular earbuds and combines it with a Bluetooth collar that can be tucked under most collars. The earbuds can be removed from your ears when not in use. They can hang freely or attach to the collar with little magnets. The collar portion has controls for controlling your music or audio playback and volume. It also controls your phone; which in my case is the iPhone 4s. I click a button and Siri does the rest (most of the time). I love the device for podcasts, music and watch video and movies on both devices. The LG Tone is the perfect companion to the iPad for solitaire sound listening, but what if you need others to hear sound from your iPad? 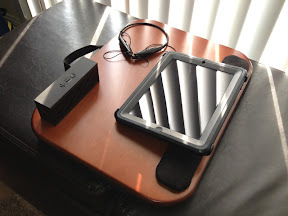 I use the Jawbone JAMBOX , with my IPad, when I am enjoying my IPad with others. "JAMBOX delivers stunning hi-fi audio in a portable wireless speaker so compact you won't believe it when you hear it. It's loud." Copied right from their marketing material, I could put it any better. "With an output capacity of 85 decibels, JAMBOX fills even the largest rooms. Unlike other portable speakers, the Jawbone JAMBOX is powered by a pair of proprietary, highly sophisticated acoustic drivers, unmatched in their ability to produce extreme high (tweeter) and low (woofer) frequencies from a single, ultra-small dome speaker. They work in concert with an innovative moving-wall passive bass radiator and airtight enclosure to deliver shimmering highs and thumping lows that you can literally feel - the richest sound all in the palm of your hand." Again, we try to rearrange the words, if they are correct?This small speaker is very nice. It comes with everything you need: JAMBOX, a 60" micro USB charging cable, a 12.5" micro USB charging cable, a 36" 3.5mm stereo cable, a carrying case, the A/C wall charger and a user guide.The connections are simple. It connects to the iPad via Bluetooth, but it also has a 3.5mm Stereo Input so you can use the included 3.5mm cable to connect to the iPad or any other device that has a 3.5mm port. The Micro-USB port is used to charge the device or update the software when connected to a computer. Simultaneous Multipoint (enabled via MyTALK): make connections to two devices at the same time possible.JAMBOX gives you the freedom to bring wireless audio to whatever you are doing, wherever you want. Carry it from room to room or just throw it in your bag - it's always ready to go. No more cords, docks or hassles. With Jawbone JAMBOX , you can also enjoy streaming music, podcasts and sporting events while using your phone to do other things like email, posting to Facebook or browsing the web. The best part is that you can let others enjoy the audio with you. The Jawbone JAMBOX has a built-in microphone which allows you to use it with your phone; whether it is an Android or iPhone. If you have a phone call that you need to include others, this is much better than the phone's speakerphone. Between the LG Tone and the Jawbone JAMBOX , I can enjoy my iOS devices by myself or with others. I agree, I own the same pair and it just works fantastic! Whatever it is you're using right now, ditch them for the LG Tone! Not many people even know they exist. If they did, they wouldn't be paying 3-4 times more for the outdated single ear device that is only mono instead of stereo. Not having to keep something in or on my ear is fantastic. I like how you think apple is so thoughtful (that they would be concerned if you drop and break your ipad!). I think, had they thought of that idea...to encourage dropping...they would give out numerous pairs of headphones! LOL Janet. I am sure the main reason is to keep the cost down, but my idea is still valid. I hope Apple abandons those old outdated wired headsets; in my opinion they are the worst headsets on the market. They are very uncomfortable. Apple sells a better in-ear headset in their stores, but continue to include the outdated pair with iPhones and iPod touches.